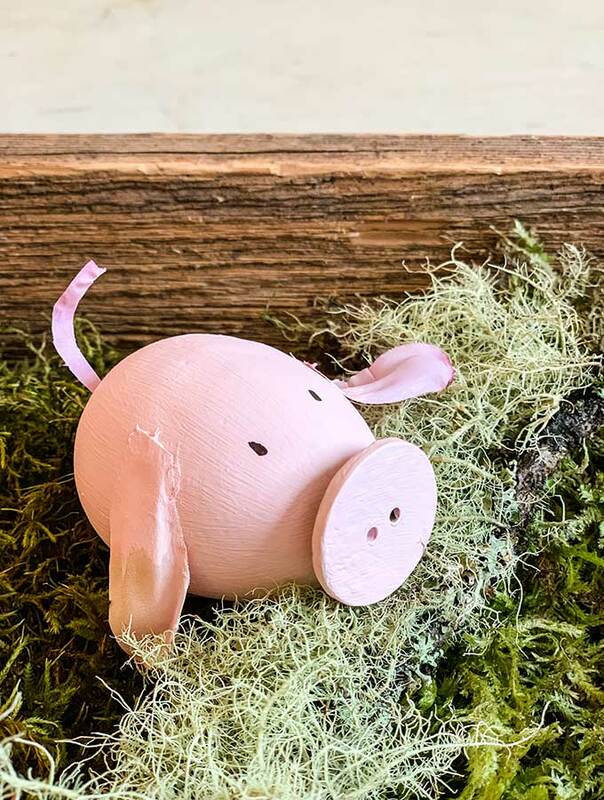 Have you ever seen a pig Easter egg? Well I hadn’t either, until I was browsing on Pinterest and got some inspiration when I saw little farm animals. They were just too cute to pass up and not share with you! So now I will share how I created Farm Animal Chalk Painted Easter Eggs, and show you all the fun in making these. They are actually so simple and the kids will have a lot of fun making them. Okay.. well I also had a lot of fun too. So if you’re an adult or kid you will definitely enjoy this craft. Oh of course I will share another egg decorating idea, I made velvet Easter eggs and they are so elegant for your Easter decor. To begin first hard boil your eggs. I hard boiled mine for about 10 minutes. But there are also many other options you could do for the eggs. Like you could blow them out or even use faux eggs. Anything will do just remember to eat up your hard boiled eggs! Well I will admit these aren’t your typical Easter treat. 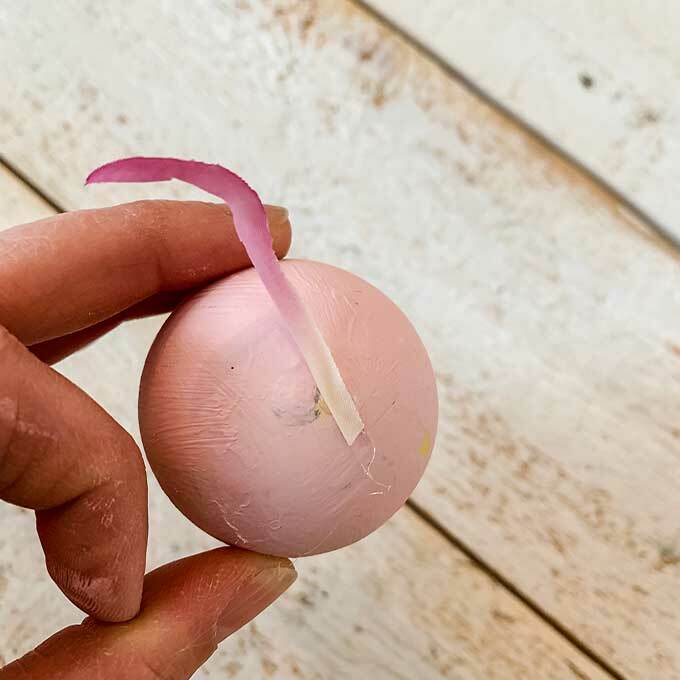 But for someone that loves hard boiled eggs, they might enjoy this treat. Okay well I have a better option, you can still make little piggies out of a normal Easter egg ya know the ones that split in half. 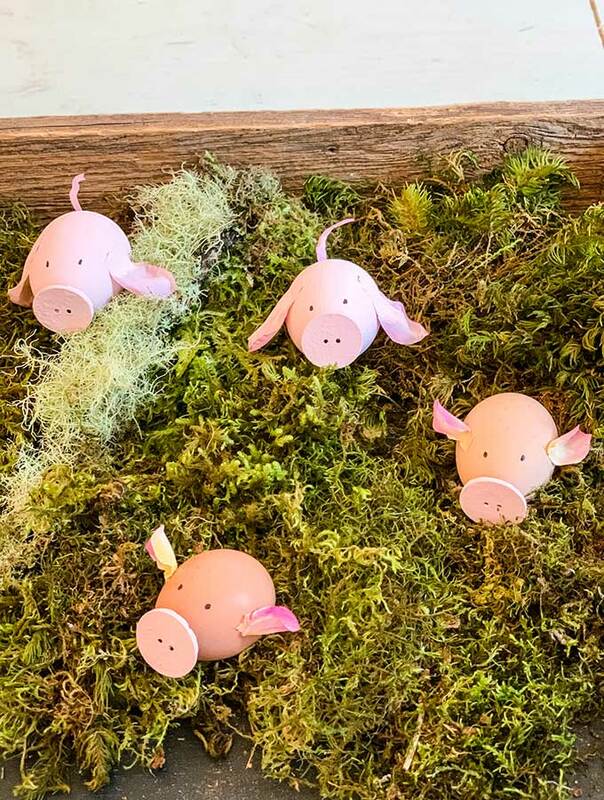 Those would be perfect for a pig Easter treat! I’m telling you these are easy peasy. 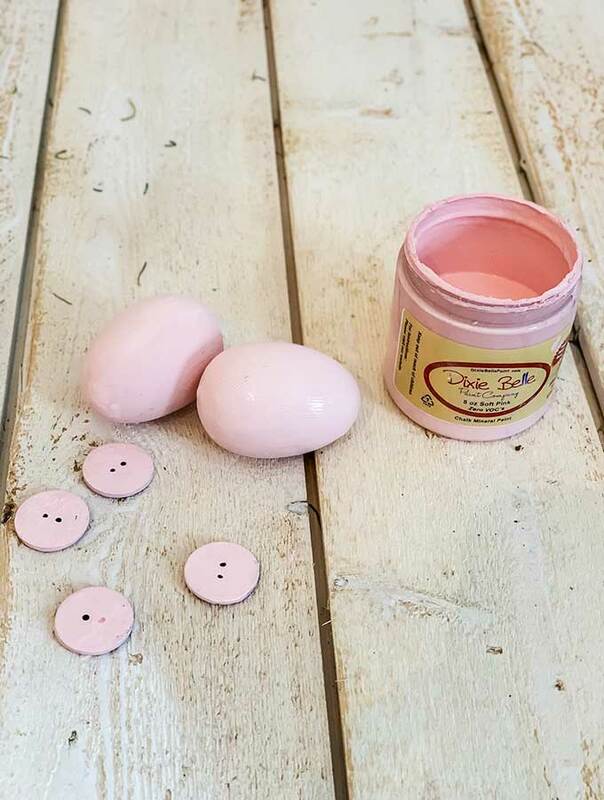 So start by grabbing your egg and using Dixie Belle’s Soft Pink, I thought that would really represent a great piggy pink. I just started painting all around the egg, but don’t forget to lay down some cardboard because it will get messy. After I painted the eggs, I then painted the buttons that were going to be the noses. Now just wait for the paint to dry. 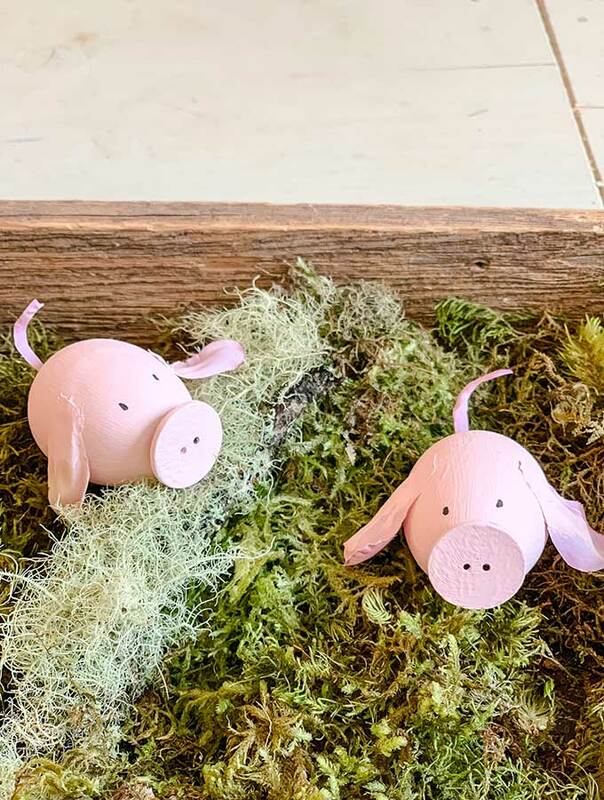 This is a great diy for kids to do, they would love to create their own pig. While the paint is drying, I cut off some pink petals from a faux flower arrangement I had. 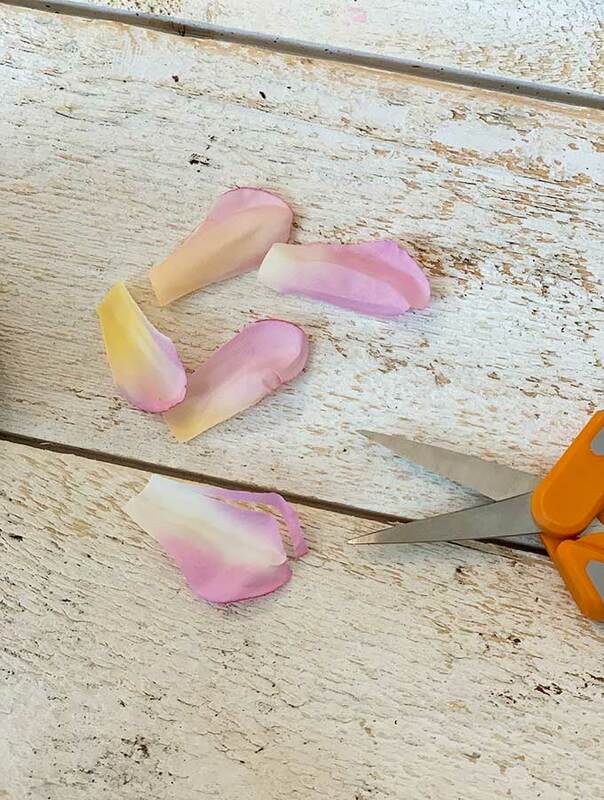 These petals are going to be the ears and also the tail. For the tail I just cut it in the shape I wanted the tail to be in. Then glue the nose, ears, and tail onto the egg. Just with a Sharpie I drew on two simple dots for the eyes. After I glued on the petals, I did paint over them a little to help blend in the colors. Now isn’t that super easy? I would love to see your farm animal Easter egg creations. They are so fun and you can change it up any way you want, make a different farm animal, add a crown to some, make some bright colors. The options are endless. The Dollar Store does have some Easter eggs, which would be great for a craft like this. What I love about cute crafts like these is that the kids love to make them and have a lot of fun. But the best part is, if you save them you get the see them the next year and just look at how stinking cute they are.